Runic I, like her sister Cufic I, was a cattle carrier, designed to carry 1,000 head of live cattle eastbound and general cargo westbound; she also had accommodations for 48 passengers. Built by Harland & Wolff, Belfast, and launched on New Year's Day 1889, Runic took her maiden voyage from Liverpool to New York on 21 February 1889. Her White Star career was both uneventful and short. Runic was sold to the West India & Pacific Steamship Co. in 1895 and was renamed Tampican, a name that she retained when her owner was acquired by the Leyland Line in 1899. She was then sold twice in 1912, first to H.E. Moss & Co., and then to South Pacific Whaling Co., a Norwegian firm which converted her into a whaling ship. South Pacific renamed her Imo. On 6 December 1917, Imo made history when she collided with the French Line's Mont Blanc in Halifax harbor. Mont Blanc, carrying 2800 tons (2545 metric tons) of munitions, exploded, setting off what has been called "the largest manmade explosion ... before the first atomic bomb." (Paine's Ships of the World.) The blast wiped out the Richmond district of the city in a blast felt up to 270 miles (430 km) away. The casualty figures were astounding: at least 1600 killed, up to 2000 more missing and never found, 9000 injured, 25,000 at least temporarily homeless. In all, over 1600 buildings in a 16 mile (26 km) radius were destroyed and 12,000 more were damaged. The total property loss was estimated at $35,000,000. The explosion also caused a 13 foot (3.96 m) tidal wave that destroyed buildings and damaged warships designed to withstand enemy attack. Mont Blanc herself was obliterated. 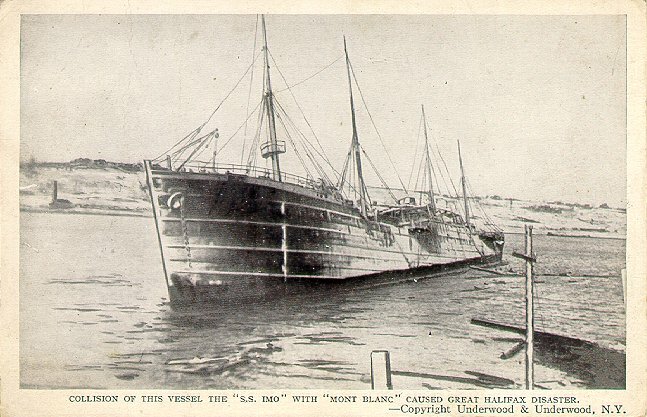 Imo survived, although badly damaged, as shown in the card on this page. After repairs, Imo was renamed Guvernoren and returned to her prior whaling duties. Guvernoren went aground on rocks near Port Stanley in the Falkland Islands on 30 November 1921, and was a total loss. Sources: The New York Times, 7 and 8 December 1917; Bird's The Town That Died; Kitz' Shattered City; Paine's Ships of the World; Haws' Merchant Fleets.